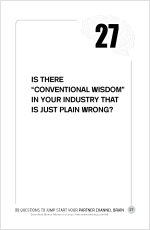 Is there “conventional wisdom” in your industry that is just plain wrong? John Fox is blogging through each question in his book: 99 Questions to Jump Start Your Partner Channel Brain. Conventional wisdom and stereotypes share many similar attributes—they’re wrong a lot of the time. Even really smart people like Andy Grove have been known to trust gut feelings too often. In 1969, Grove questioned why anyone would need a calculator when a slide rule would do. 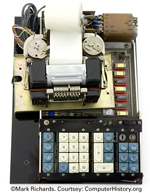 Fortunately for Intel, the computer revolution and me, a custom design and manufacturing order from Busicom literally forced Intel into the microprocessor business and, as they say, the rest is history. Funny how customers can get you to do the right thing. But which piece of Channel Partner conventional wisdom is the worst offender? To answer this question I interviewed noted channel veteran, Allan Behrens, Managing Director at Taxal Limited. Taxal provides analysis, advisory, research and business services for IT users, product and service companies looking to increase revenues and profitability. The cool thing about Allan (and why I recommend LinkingIn with him, as I have) is that he’s been successful on both sides of the aisle, giving him a perspective on Channel Partners few others share. In the 1980’s and early 1990’s, he helped build HP’s Partner Channel in Northern Europe and then left HP to become an HP Channel Partner. That’s a real testament to the strength of the program he created and a real world example of the intangible and tangible benefits I covered in Question 13. “There are obviously many, many areas where I think the conventional wisdom is probably wrong. But the one which sprang to mind was that of Direct Sales forces deal with major accounts and Indirect Channels deal with small or medium organizations [SME/SMB]. Whilst that may be significantly true or may be current practice in many organizations, that’s not necessarily the right thing to do. Many (especially large IT) companies believe that they have good reasons to deal directly with major accounts. It retains margin (but increases direct costs), and it may deliver what the customer want, especially in areas of multi-national account consistency. I would argue, especially having been in the channel world (run resellers myself, and been a reseller), that there are many reseller operations and business partners that have as much, if not more competence, touch, and empathy to deal with major accounts than vendors themselves. There is an expectation within some companies, and I think it’s a mis-set expectation, that the competence of the internal sales reps is higher than that of the channel and that’s definitely not true. It may be one of the ‘reasons’ for going direct. There are a lot of channel partners whose sales and management expertise is very significant, highly valuable, and additive. The benefits they can bring to bear in areas such as integration and solution development, client relationships and industry competence are often undercapitalized.